what's the optimal Stringing Pummel set looks like? and what's the hybrid set to fight along your puppet for strong AoE mobs? It's what I use (minus Regal, which I don't have yet). think the puppetmaster's collar +2 with max aug good for ws? how about the heyoka +1? Hey all, recently unlocked augmentation on Mythics and I'm going to slowly but surely start progress on my Kenkonken. This has re-sparked my interest in hybrid DPS sets and was wanting sime input since I know my past sets had been a little janky. So for building AM3, I want the obvious TP stats like Multi-hit, acc tiers, etc etc. Is there any situation (like literally no buffs) that Kenkonken would need more Martial Arts? And theb of course once AM3 is up... I know the general rule would be to tone down the multi-hit in favor of STP but most other mythic dps jobs don't have a pet to consider. Just /how much/ consideration should I make for Mushroom in this set? I assume at minimum I should cap pet haste. Is it worth wearing Enmerkar over Telos (assuming Rimeice is being used for pet haste in the other slot)? Pitre Tobe +3 over Ryuo Domaru +1? Etc etc. Also I know and love Moonbow Belt +1 but do the stats give as much benefit with AM3 up as oposed to down (like is Klouskap +1 worth in it's place). Also general mytic dps question that's been on my mind. When people say "maintain AM3" is it better to hold TP to 3k for the last 20 seconds or so of your AM3 effect or do you let it wear entirely before trying to re-apply? That’s usually how I do it (hold TP for the little bit before it wears). PUP isn’t exactly a TP-building monster in our master-pet hybrid set, lol. in low buff situations, pretty sure the puppet will be pulling most of the weight so having a hybrid that favors it more is ideal and doing the reverse when in high buff master situations, whenever those are on pup. Could also make a pure master TP set to speed you up to AM3 when its close to wearing, general idea in regards to maintaining AM is to guage how long it takes you to build to whatever amount you need and just be mindful to do so when its close to wearing like sirris said. To answer your question about how much consideration you should have for your automaton... recently I've found it really depends on the types of content you do. I used to be a big fan of the hybrid pet/master TP set, due to its long self-skill chaining capabilities, but after having mastered the job (so... no more chaining Apex) and gotten specific pieces of gear that I sought after (so... no more simpler NM soloing where I am engaged alongside my pet (like Belphegor)), I've become more and more focused on front loading the masters damage. As a result my combined pet/master hybrid set has been collecting dust... I guess what it boils down to is whether or not you find yourself in situations where you are getting plenty of buffs from the other support jobs or not. The masters damage takes off in comparison to the automaton when properly buffed, so I found fighting in a hybrid pet/master set is actually a big detriment in those scenarios. But if you are often finding yourself in situation (C) no buffs in solo/low man, then yea you definitely want to cap your automatons haste at the bare minimum. Unfortunately, outside of the +10% Pet Haste from Ambuscade cape, our options are quite limited, and like Sirris mentions above, the Masters damage output and TP generation usually takes a hit in doing so. Try to figure out some combination of tali'ah crackows +2, foire taj +3, foire tobe +3, foire babouches +3, Thurandaut ring +1, and the entire Heyoka armor set which brings your Automaton as close to 26% Haste as possible without crippling the master too much. Wow your experience greatly resembles my own! I found I was either tanking, Overdrive zerging, or doing PUP only events in which I was never personally engaged so I dropped the set entirely. In situation B I am likely on BRD. I also used to use Heyoka Subligar, Tali'ah Crackows +2 and +10 on Ambu cape. Haha, well it seems I was not very far off from it. I mostly dropped that because on the flip side I would like to keep my Ryuo Hakama +1, they are just too damn good. I'll have to take another peep at my sets, though honestly I will probably just "bare minimum cap haste" in my hybrid. Thank you everyone for the input, including the input on maintaining AM3! Any new feedback on Xiu? How does mythic afterglow compare to rank 25 Xiu? Last few pages have some Xiucoatl discussion. I'm not the type of person to just say "durr hee hee read the thread, durr hee hee use Google" so here are my thoughts. For pet-only dps it is unbeatable. No contest. My Arcuballista and Daze average out at 15k-20k dmg depending on the target, attachments, and maneuvers. In Ovdrdrive I peak at around 21-22k. Armor Shatterer is around 10k-12k. My Xiu is only rank 21 so this could be higher. After the changes to WSD it was debatable if Xiu or augmentented Kenkonken was better for hybrid DPS, but since the change has been reverted I doubt Xiu could beat it. That being said it still has very very high base damage, a good hunk of accuracy, and master WSD +10% on top of the Automaton ability damage +25%. So I don't really think you can go wrong. Not to mention fully augmented Kenkonken takes a lot more time, gil, and work to make useful for something as niche as hybrid dps. Again this is just my thoughts. 2. BLM Automaton seems to have separate casting timers. Onion deployed his puppet right away, before my puppet could complete a skillchain. His puppet casted Thunder V. Very soon afterward, my puppet completed a Distortion SC, which caused Onion's puppet to immediately cast Blizzard V for the Magic Burst. He (Onionknight) kept his Automaton deployed. During various points in the battle, my puppet would get stunned. Onion's puppet would cast Thunder V, but as soon as my puppet did a skillchain, Onion's puppet would immediately cast a magic bursting spell. So my question is, for those more experienced with mage automatons, has this behavior ever been observed? Also, Onion felt there was one Automaton attachment that was bugged. But I'll let him explain it further, as I, personally, am extremely out of practice with the Black Mage puppet. I have not seen that behavior Siv. I have seen my blm automaton miss alot of bursting opportunities when I left it deployed. It gets some also, but I have not seen it break the global spell casting timer. any information on the blm auto's attachment loadout? we basicly had siv's puppet skillchaining and my puppet mbing. What ive noticed is that the puppet has 2 recasts. 1 global slow recast and a 2nd mb only recast wit a very low recast. that this has its own recast becomes appearant when you use mana channeler. mana channeler adds recast to the puppet. What i do believe to be an oversight is mana channeler not only adds recast to the global timer, but to the mb timer aswell. This effectively makes the mb attachment useless with mana channeler. I really hope this is a bug and not meant by SE. i can send you my attachment list later, but it wasnt special. Yes, this is exactly why I was asking. because I was curious how these comments relate to Mana Channelers and Amplifiers. to do bursts. Which pretty much puts you on a 1 minute burst cycle for deactivate timer. I usually would do this on wave 1 boss on dynamis runs or omen runs vs Kei. but its been awhile, and I never tested because I was focused on other things after wave 1 boss was down. while waiting for deactivate timer, I would often cycle other maneuvers trying to get another burst in before deactivate timer was up. Occasionally I kept it up just too see how long it would take to burst again. I didn't time it, but it seemed to take far too long. It sounds like if we drop mana channelers and keep pet deployed we can burst quite frequently. I would love to do some more testing with this. did you ever do multi-step skillchains? was your auto able to burst on multiple steps of 1 chain? A bit late to the discussion, but I'd like to add my 2 cents. Massive amount of STR, Acc, Atk, Crit Rate, Crit Dmg. It's been a while, but I tweaked this set using a modified version of the MNK DPS spreadsheet, so it may or may not be reasonably accurate. In any case, Rao Haidate+1 B performs better than Hizamaru legs+2 due to higher STR, massively higher Attack and STP on WS for follow up, as WSDMG+% doesn't do much for SP or VS. Ryuo feet+1 D are only beaten by extremely well-augmented Herculean Boots, but they're really great for the Crit Rate and very high Attack+ due to triggering the set bonus with Ryuo hands+1. Lastly I've also had Heyoka Harness+1 outperform Adnoba, to my surprise, likely due to the much higher STR, Acc and Crit Rate, even though it lacks Crit Dmg. Head, Cape, Legs pretty much cap the Automaton at 25% gear Haste while the Heyoka+1 also provides massive Accuracy for both and Crit Rate for white damage. I chose Heyoka cap+1 over other slots, as Herc Hands/Feet have a native Triple Attack+2% in addition to the augmentable TA+4%, making them far superior to Herculean Helm or alternatives. Xiucoatl would be Path B, as I feel it would outperform KKK due to higher base DMG and not needing to maintain AM3 (which also doesn't stack properly with DA/TA, unlike Follow-up attack). I have yet to obtain Verethragna, but I don't think even a fully augmented one could parse competitively due to the much slower TP speed. As far as legs go, perfect Samnuha Tights would also work very well, but I opted for Ryuo legs+1 D for the high Attack from the set bonus for white damage, high STP for multiattack (FUA+1, DA+23%, TA+29%, QA+3%) and much needed PDT, as PUPs are very squishy compared to other DD. But either works. Lastly, with regard to the BLM maton, I did some testing of my own not too long ago. With ADD/DAD, the Automaton will always open with Thunder V regardless of skillchain element, so it's not really a useful strategy anymore unless you have Impaction/Fragmentation/Light going--especially if your group is doing a multistep skillchain with SCH and COR. That being said, my go-to Automaton setup to MB multistep skillchains is as follows: Tactical Processor, Mana Booster, Amplifier 1+2, Loudspeaker 2, Heatsink, Stealth Screen II, Mana Tank 1+3+4, Optic Fiber 1+2. Heatsink and Stealth Screen II are mostly just filler, Mana Tanks to increase the time between DAD for for MP. Why Tactical Processor and Mana Booster over Loudspeaker 4 and Ice Maker? Yes, it's a massive damage difference (minus 6k~ per nuke just from the lack of LS4), but those two attachments usually allow the Automaton to burst once every new skillchain with triple Ice Maneuvers (very rarely also double MB), while also allowing it to cast Aspir II inbetween if the target has MP (which Dynamis Statue bosses do). LS4 and Ice Maker are obviously still superior if you only have a solo SCH creating slower skillchains and you have time to reapply 3 Ice Maneuvers between each round, but my LS doesn't do things that way. i was using tactical, loudspeaker 4 and amplifier 1 and 2. that one is enough to chain mb with 1 puppet solo skillchaining. Mana Booster doesn't do much for MB nukes, as Amplifiers already massively increase cast speed. It's mostly intended to speed up Aspir II between nukes, if the enemy has MP. BLM matons don't get a lot of use nowadays, so the Dynamis statue bosses are usually our prime target--and they always have MP. Same goes for CPing on Apex Crabs, I suppose, but typically you'd be better off meleeing there. It is not about trying to get blm puppet into content. Its about 1 attachment(Mana channeler) being useless for the BLM puppet because it conflicts with a newer attachment(Amplifier) because SE did not know how mana channeler works when they designed amplifier. Also Mana booster is worthless. It lowers casting times on both global and mb timer, but mb timer is already capped to lowest casting time. It works for the global timer, but global nukes are worthless since those are almost always outside a magic burst and nukes outside magic burst are always nerfed in damage due to low stats. Still i feel mana channeler should be different. It can up the recast on the global timer, but it shouldnt up the recast on the mb timer. Uh, okay? I pretty much said the same thing about Mana Channeler being useless, so I'm not sure why you are repeating yourself. Feels like you're just trying to argue with me without actually reading what I wrote. I specifically said Mana Booster isn't meant for nukes, but to decrease the delay that's caused by the maton casting Aspir II inbetween nukes, which is extremely slow otherwise. Which is an issue if you are MBing multistep skillchains on bosses with MP. Outside of that I wouldn't bother with Mana Booster either. I didn't perceive this as an argument. ¯\_(ツ)_/¯ maybe I shouldn't have used the word "argue", but calling Mana Booster worthless when I outlined its one specific use-case isn't exactly a constructive discussion. Yeah i wasnt trying to argue. your absolutely right xilkk. I was just stating the observation of amplifier adding 2nd ability to the puppet besides the normal casting. not meant as arguement. Aerix yeah i forgot to type Mana booster is useless for BLM puppet. 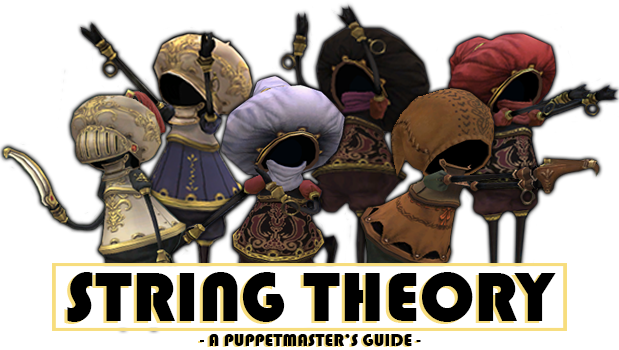 For the WHM and 'RDM' puppet it is good. When you only have 1 timer on magic spells on the puppet mana booster is good. If it was perceived as arguement, it wasnt one. BTW im trying to maximize blm puppet dmg now by upgrading its gear with the 2 pitre +3 pieces. I gotta see how far its dmg can go compared to the tests siviard and i did 2 days ago. Best wishes on the test. Hightest I've been able to get was an 80k in Thunder V in Dynamis D Bastok on the midboss w/ Ice Maker. BLM Puppet set up to SC/MB also works well solo or maybe with a partner during CP. I may have posted an exhibition video of this already on another thread in this forum, don't recall. So HTH accuracy cap is supposedly 99% for both hands now; that's a pretty big buff for PUP. I imagine this will help solo Leaders in Dynamis, something I want to do badly. You're right though, the Automaton is being left behind further considering it no longer out DDs the master these days anyway. I've confidence the devs will eventually look to make needed changes to the Automaton. Likely not what we'd want but changes that could potentially help nonetheless. Does anyone have augmented path C Xiucoatl? Need a screenshot of the augment. I don't think SE would ever allow matons to 3-step Light/Darkness by giving VE Fusion or Sharpshot a Distortion WS. So perhaps something reasonable would be Light/Fragmentation for Valoredge triggered by Fire and Darkness/Gravitation for Sharpshot triggered by Wind. I think that would allow us replace Bone Crusher and Armor Piercer with stronger WSs while also keeping OD zergs intact (and even making Light/Thunder/Fire useful on VE). Would make it harder to force the Defense Down of Shatterer, though. 1) Makes me want to go BACK to Foire+3 body & Pitre +3 hands as my default Pummel/Smite pieces. Sure, WSD+10% only helps on first hit, but they both have a ton of attack that is very useful until you're capped pDIF... which is now harder for PUP to hit thanks to the higher limit. AND they're high accuracy, which is obviously important for a multi-hit WS, especially with the apparently changed H2H accuracy cap. It's still ultimately going to be dependent on situation, but now seems much more likely to be that you'll be more able to get everything out of the JSE+3 pieces versus choices like Ryuo+1 hands or Heyoka/Abnoba body. It's been a wild last ~4 months or so for that question. I already kinda liked the JSE+3 pieces prior to the couple months of 'WSD affects all hits' (since let's be honest, PUP tends not to cap anyway unless you really have a ton of buffs that I don't often see in practical situations), they were obviously the best during the WSD "glitch" period, then they dropped back down a bit after last month's update, and now they gain some more potential advantage.